Across town on Madison Avenue, Lévy Gorvy Gallery takes music seriously enough to retain the services of an astute cultural program curator, Brett Sroka, himself an accomplished composer and trombonist. On Sroka’s watch, the gallery has presented ambitious performances by Peter Evans, Burnt Sugar, Alicia Hall Moran, and Maria Chavez, each linked in some meaningful way to the art then on view. And on Nov. 28 Lévy Gorvy complemented its current show, Calder/Kelly, with a performance by TILT Brass, eight of whose members dispersed among the gallery’s three floors and stairwell for the premiere performances of Vertical Octet by the Brooklyn composer and improviser Lea Bertucci. From conception to execution, this event was a thoroughgoing success. 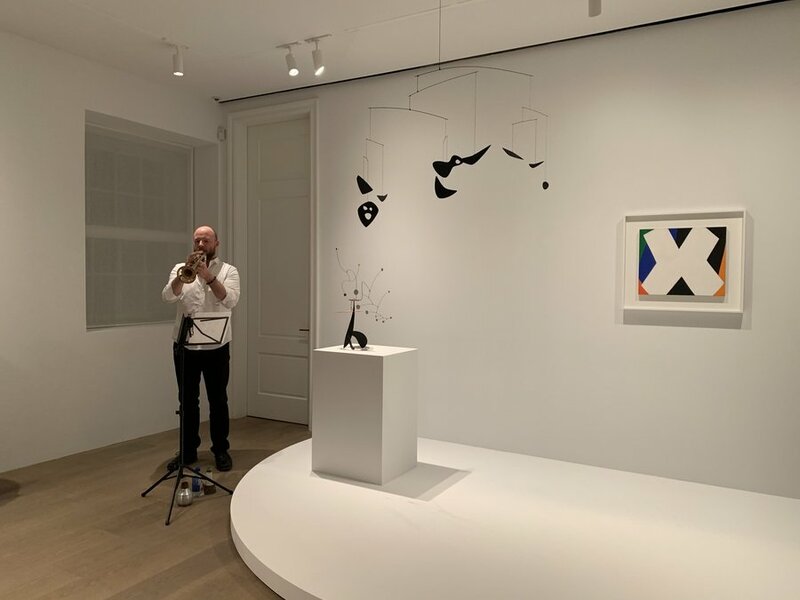 The show, a mix of mobiles and stabiles by Alexander Calder (1898-1976) and paintings by Ellsworth Kelly (1923-2015), is meant to commemorate the friendship between these two artists, who exchanged letters and artworks, and who spent some formative portion of their careers in Paris. 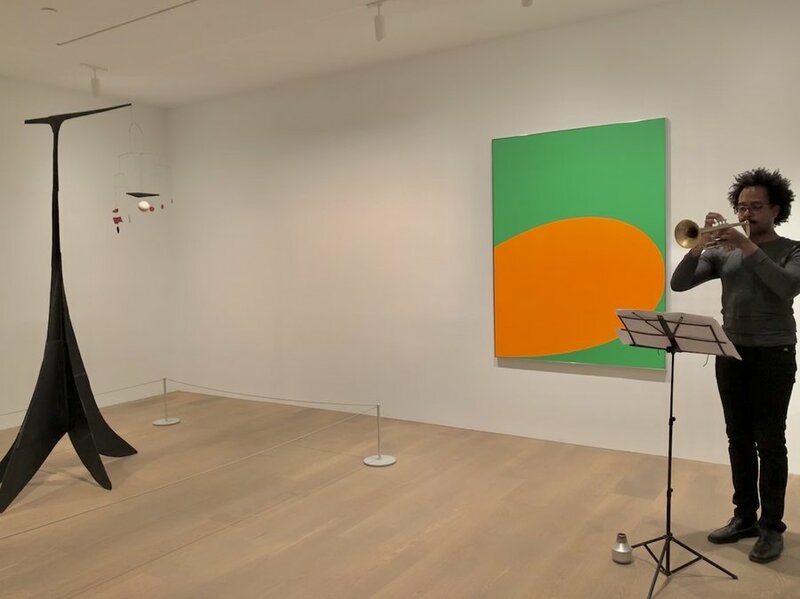 In real terms, it was a conversation between Calder’s three-dimensional forms, whether solid and grounded or spindly and suspended, and Kelly’s planes of solid tone, whether monochromatic or with contrasting hues in proximity. Searching for a composer similarly preoccupied by shape, space, and planes of tone, one could hardly do better than to choose Bertucci, whose recent works have pursued a similar focus on tones and overtones, on flatness and mobility, and on sonic volume situated within spatial volume. Many of Bertucci’s scores themselves approach a quality of visual art, and in 2017, with author and artist Michael Anzuoni, she oversaw the editing of The Tonebook, a gorgeous collection of graphic scores published by Inpatient Press. Peeks at some of the parts on music stands here before the performance started revealed a combination of conventional notation and graphic gestures.